Plot Summary: The Goddess Venus is jealous of the beautiful human girl Psyche and blames her pet unicorn, Unico, as Psyche's source of good luck. Venus has Unico banished, and it becomes the West Wind's duty to take Unico from one place and time to the next. Taken to a heavily polluted city, Unico meets a sickly girl named Chiko who is suffering because of the pollution of a nearby factory that darkens the entire sky. 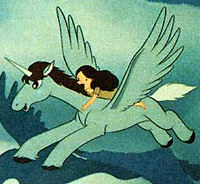 Unico then is determined to cheer her up, cure her, and destroy the nearby factory.